If you would like a demonstration of Tracker Suite, we are pleased to offer a free demo. Order yours today online, or call Automation Centre at (520) 882-9287. The JW Marriot Starr Pass Resort and Spa - Cradled in the Tucson Mountains, the resort is only 15 minutes away from Automation Centre. This resort offers a full spa, an Arnold Palmer Signature golf course, restaurants, tennis courts and scenic hiking and biking trails. The Doubletree Hotel Tucson - The Doubletree Hotel Tucson at Reid Park enjoys a great mid-town location just east of downtown Tucson and the University of Arizona, only 15 minutes from Tucson International Airport. The Doubletree is situated on 14 acres of lushly landscaped grounds, directly across from two LPGA-sanctioned golf courses, and also offers tennis courts, massage therapy rooms. Old Tucson - Known as "Hollywood in the Desert", Old Tucson has appeared in movies ranging from Rio Bravo with John Wayne to The Quick and the Dead with Leonardo DiCaprio and Russell Crowe. Old Tucson offers the "Old West" experience: live stunt shows and gunfights, musical revues and comedies. tours and scenic horse rides along nature trails. Canyon Ranch - Rated as one of the top 3 resort spas in Conde Naste's 2006 spa poll, Canyon Ranch is located in the foothills of northeastern Tucson. Canyon Ranch offers activities including scenic hikes and biking, full salon services, and over 40 daily fitness classes. 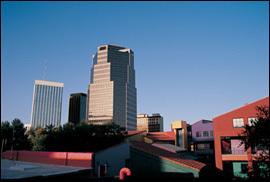 The Tucson Marriot University Park Hotel - Located next to the University of Arizona, is only minutes away from Automation Centre. This hotel offers the high quality amenities that Marriot is known for, and is in walking distance of four museums as well as twenty-nine restaurants, shops and boutiques. 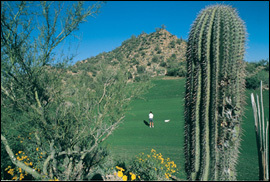 For more about Tucson offerings, visit www.VisitTucson.org. We would welcome the chance to meet with you to personally discuss our products. You can contact us via e-mail at info@acentre.com. If you would like us to arrange any activities, such as a golf outing, during your stay, please let us know.